High-tech dyes that are of great interest in the study around organic electronics have recently been prepared and crystallised at TU Wien, Austria, all that is required is water. Organic dyes are impressive not only because of their radiant and intense colour, they also have an important technological significance. These High-tech dyes are a class of materials with extremely special properties with many future technologies likely to be based on organics molecules like these. Previously, such materials could only be prepared using complex synthesis methods that are incredibly harmful to the environment. Now however, researchers at TU Wien have successfully used a green synthesis method by synthesising several typical representatives of a material in a way that replaces toxic solvents with water. When water is heated to extremely high temperatures, its properties change significantly allowing for the new method. Miriam Unterlass from the Institute of Materials Chemistry at TU Wien said: “If you were to listen to your initial gut feeling, you would actually suspect that water is the worst solvent imaginable for synthesising and crystallising these molecules. “The reason for this expectation is that the dyes we produce are extremely water-repellent.” If you drop water on some dry powder, the droplet will roll off. The dye cannot be mixed with water. However, this behaviour only applies to water as we know it from everyday use, so the researchers used water heated to at least 180°C in a pressure vessel so that the majority of the water remains in a liquid state. The properties of the water changed dramatically under these conditions. The high number of ions in the water at elevated temperatures is a key cause for allowing the dissolution of organic substances that are entirely insoluble under normal conditions. Consequently, the dye molecules studied can not only be synthesised in water, but also crystallised: they dissolve at sufficiently high temperatures and then crystallise as they cool down. 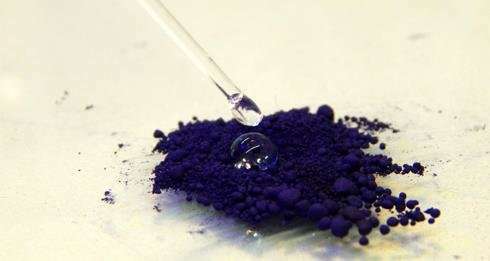 For the crystals obtained, however, there are also some quite different potential applications as according to Unterlass, they can be used whatever the requirements for dyes are.